Published: Nov. 22, 2018 at 10:09 p.m. 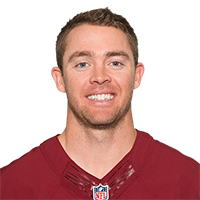 Published: Nov. 22, 2018 at 06:48 p.m.
Washington Redskins quarterback Colt McCoy hits his wide receiver Trey Quinn for a 10-yard touchdown. Published: Nov. 18, 2018 at 03:10 p.m.